Three teams earned a $20,000 prize check and a slot to launch their CubeSat on Exploration Mission-1, the first integrated flight of NASA’s Space Launch System. 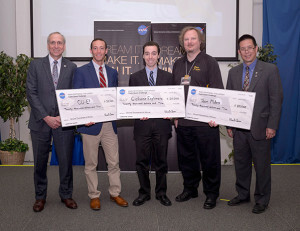 NASA’s Associate Administrator of the Space Technology Mission Directorate, Steve Jurczyk, Benjamin Fried of team CU-E3, Kyle Doyle of team Cislunar Explorers, Wesley Faler of Team Miles, and NASA’s Ames Research Center Director, Eugene Tu. NASA’s Space Technology Mission Directorate has awarded rides for three small spacecraft on the agency’s newest rocket, and $20,000 each in prize money, to the winning teams of citizen solvers competing in the semi-final round of the agency’s Cube Quest Challenge. * Cislunar Explorers, Cornell University, Ithaca, N.Y.
* Team Miles, Fluid & Reason, LLC, Tampa, Fla.
Tucked into the Orion stage adapter – the ring that connects Orion to the SLS rocket – the CubeSats will deploy after the Orion spacecraft separates from SLS and starts on its journey into deep space. These small satellites are each about the size of a large shoebox and designed to be efficient and versatile. As some of the first CubeSats to operate in deep space, they will drive advances in small spacecraft propulsion and communication technology. The final phase of the Cube Quest Challenge comprises two segments: the Deep Space Derby and the Lunar Derby. In the Deep Space Derby, teams must demonstrate communications capabilities from a range of at least four million kilometers from Earth – more than 10 times the distance to the moon – while the Lunar Derby requires teams to achieve a lunar orbit where they will compete for near-Earth communications and longevity achievements. Prizes will be awarded for orbiting the moon, communicating the fastest and farthest, and surviving the longest. The Cube Quest Challenge offers a total of $5 million, NASA’s largest-ever competition prize purse, to teams that meet the challenge objectives of designing, building and delivering flight-qualified, small satellites capable of advanced operations near and beyond the moon. The challenge is a part of NASA’s Centennial Challenges program, based at the agency’s Marshall Space Flight Center in Huntsville, Ala. Centennial Challenges is a part of the agency’s Space Technology Mission Directorate. The challenge is managed at NASA’s Ames Research Center in California’s Silicon Valley.